I’m looking at a dealer making a net profit of about $2 million a year, plus a nice salary and a dynamite boat. I wonder what would happen if the dealer would just allocate another 10 percent of his advertising budget to fixed operations? I’ll let you do the math. Everybody agrees it is vitally important to monitor and measure sales performance on a daily, weekly and monthly basis. That’s where you make your money, right? Well, I’m here to tell you that if that’s as far as your thinking goes, you’re wrong. 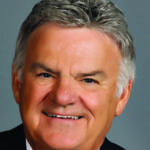 He is averaging 115 retail units per month (new and used) at an average gross profit PRU of $2,058, which equals $235,660 in total departmental gross profit for the sales team. His service and parts teams are producing an average of $246,721 per month in total departmental gross profit, which based on his average PRU of $2,058 is the equivalent of selling 120 units per month. I did not include the additional $85,000 in gross profit per month from his body shop, which is the equivalent of an additional 41 units per month. Is this fair and balanced or what? I measure the value of technicians and service advisors by comparing their gross profit contributions to those of the sales department. Now it is time to make that same comparison for the fixed ops director. This is the person who is responsible for managing the service department, parts department and body shop to achieve 100 percent service absorption while building customer retention. To begin, we must identify this position’s responsibilities as they pertain to these departments and then evaluate the person’s performance filling this position. In doing so I would again like to compare the “back end” of the dealership to the “front end.” The fixed ops director’s counterpart in the front end would be the general sales manager who oversees the new vehicle, used vehicle and F&I departments. Let’s look at each of these key managers’ responsibilities to the left. Do you find it interesting that there are so many similarities in their respective positions? As a dealer or general manager you should spend about the same amount of time working with your fixed ops people. Do you allocate about the same dollars in marketing and advertising support for each of these managers? I already know the answer to that one. Maybe you should consider re-allocating some of your advertising and marketing dollars spent on the front end to the back end. Why, you ask? Let’s get back to those financial statements and see why. I see he has redeemed himself a bit by spending 90 percent of his training budget (about $23,000 a month) in fixed operations training and only 10 percent in the sales department. You’re probably thinking “this guy is nuts.” He’s spending almost as much on training as he is on advertising — how does that make any sense? In my world, it’s called 100 percent service absorption. That’s how he got that net profit of about $2 million a year plus a great income and that boat. How much more can this dealer make if he would just allocate another 10 percent of his ad budget to fixed operations? You can figure it out. Now, you can see what my point is, right? Give your fixed ops director the support and attention that he or she needs (including training) to become a top performer. Measure their performance and hold them accountable for their performance just like you would the general sales manager — daily. You just might see your service absorption start to climb toward 100 percent. This strategy will aid in making your dealership recession proof. 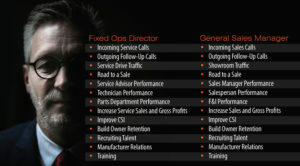 Your fixed ops director must be the leader for your service team. Starting today, you might want to make it happen.